For the European Parliament to confer legitimacy on the EU’s legislative process it is necessary for voters to be aware of the actions taken by MEPs. But how do newspapers cover the work of the Parliament? Based on a study of newspaper coverage of 302 MEPs, Katjana Gattermann and Sofia Vasilopoulou write that the visibility of individual politicians in the media is not greatly linked to their legislative activity, but instead to their wider profile in domestic politics. As such there is a potential motivation problem concerning MEPs with career ambitions in national politics, as they may benefit from spending less time in the Parliament. Members of the European Parliament (MEPs) represent their citizens in European Union policy making, having the power to approve, amend or reject the near majority of legislation. The media inform EU citizens about their representatives and are able to hold them publicly accountable. News media thus play a key role in the representation, legitimacy and accountability of the EU. But to what extent do newspapers actually report about MEPs and what explains why some MEPs receive more news attention than others? To answer this question, we analysed two major quality newspapers in five EU countries: Britain, France, the Netherlands, Germany and Italy. By doing so, we were able to compile monthly measures of news visibility for 302 individual MEPs over a two year period (September 2007- September 2009). We found that a high proportion of MEPs receive regular news coverage. One fifth of the MEPs in our study (61 out of 302 MEPs) were visible in the news in at least 13 out of 25 months. If we consider that they receive coverage approximately every other month we can consider this to be regular. Only 13 per cent of our MEPs had zero visibility, receiving no press coverage at all. This suggests that EU citizens will recognise a number of MEPs in their national media, and it shows that news coverage is able to provide some linkage between MEPs and those they represent. We also identified the most visible MEP in each country in this period. British MEP Nick Griffin, the then leader of the British National Party, received much more attention compared to other British MEPs in Autumn 2009, mainly because he appeared on the BBC show Question Time. 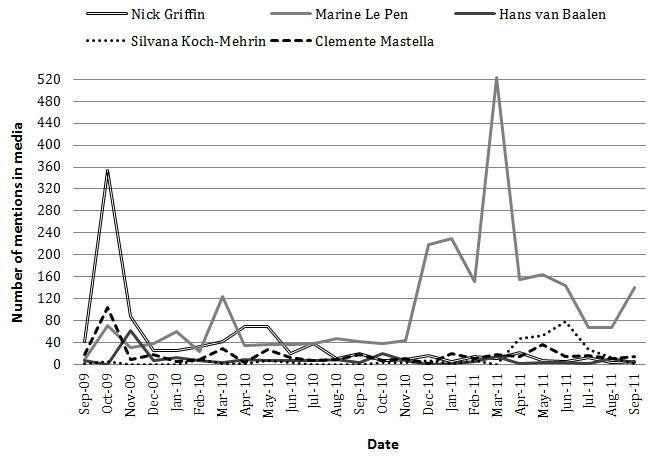 French MEP Marine Le Pen also received very high levels of news attention in the last few months of our study, which coincided with her running for the leadership of the Front National. The visibility of Italian MEP, Clemente Mastella, and Dutch MEP, Hans van Baalen, was also considerable in Autumn 2009. The latter was a key figure in the People’s Party for Freedom and Democracy (VVD) and leader of its EP delegation. In October 2009 he became leader of the Liberal International and was immediately involved in a political row in Nicaragua after which he was expelled from the country. Clemente Mastella held several ministerial positions in Italy before his election to the EP via the Party of Freedom in 2009. His name was often linked to political controversies and, at the peak of his coverage, the media reported that his wife was charged with corruption. The coverage of German MEP Silvana Koch-Mehrin, who used to be a popular politician in the Free Democratic Party, peaked in spring 2011 when she was publicly accused of plagiarism in her doctoral dissertation. She then stepped down as leader of her party delegation and resigned as EP Vice-President. Country specific events and controversies therefore influence the degree to which MEPs are covered in the news. The chart below shows how this picture changed over time for the five ‘most visible’ MEPs in each country. We were also interested in explanations for the individual-level variation in MEP news visibility. We looked at two factors: “what they do” in the European Parliament (i.e. asking parliamentary questions, drafting legislative reports, and giving speeches in the plenary) and “who they are” (their seniority, status and prominence in the domestic political context). Overall we found that what they do in the EP can only partially explain their visibility levels. Only speeches brought higher visibility. Surprisingly, we found that absentees received more news attention than those who regularly attended plenary sessions and committee meetings. This suggests that ‘what these MEPs do’ outside the EP, in the domestic arena, plays a crucial role too, whether this is in their home constituency or in the national party. Indeed, we found that those who are leaders of their domestic party were more visible in the news than those who weren’t – even if we disregard prominent leaders like Marine Le Pen, Nick Griffin, Nigel Farage and others. ‘Who they are’ in terms of position inside the EP also matters: seniority has a positive effect on MEP news visibility and those who are members of the EP Bureau or hold the chair of a committee receive significantly more attention than those who do not. Finally, we found that non-attached MEPs receive more news coverage than those who are affiliated with a political group in the EP. Newsmakers supposedly respond to those European representatives who use the EP in order to gain political office at home. All of the non-attached MEPs in our sample were right-wing and Eurosceptic, making them even more likely to attract the newsmakers’ attention. On the one hand a great proportion of MEPs are regularly reported upon in the press, which indicates that European citizens are increasingly becoming familiar with their EP representatives. On the other hand, however, legislative work in the EP in the form of asking questions and drafting reports is not associated with higher visibility in the press. This has significant implications for the career prospects of politicians. If news visibility is not linked to legislative activity, then we should expect those MEPs with career ambitions at the domestic level to avoid spending time in the EP and to refrain from engaging in its activities. Katjana Gattermann is postdoctoral researcher at the Amsterdam Centre for Contemporary European Studies (ACCESS EUROPE) and based at the Amsterdam School of Communication Research (ASCoR), University of Amsterdam. Her research interests lie in the field of European Union Politics and Political Communication. She is particularly interested in the patterns, drivers and effects of EU news coverage and also works on legislative behaviour and the relationship between represented and representatives in and across Europe. She is founding director of the Erasmus Academic Network on Parliamentary Democracy in Europe (PADEMIA) and co-editor of the LSE ‘Europe in Question’ Discussion Paper Series (LEQS).